The reason we sell plastic bunds made of fully recyclable, chemical resistant, UV-stabilised PE is that we know for sure it can handle anything that has been in one of our IBC’s or drums (as they are all made of plastic too). Corrosive chemicals for example cannot be stored in steel drums so therefore also not be stored on steel bunds. Other advantages are that the plastic bunds are lightweight, easy to clean, no maintenance necessary and also important … more economical. Our IBC bunds have a working area of 2.5 square meter and can hold up to 1180 litre. This is very important, because this meets the EU and US legislation. The legislation is that it needs to be able to hold at least 110% of content of the larges item on the bund or 10% of all stored items in case you’re not using it for 1 IBC. The reason why ours hold a little bit more is just an extra assurance, but it is also important to make sure you regularly clean out the bunds in case products have been leaking into it or in case rainwater can get into it. Both our single and double bunds are compatible with most forklifts and pallet trucks. 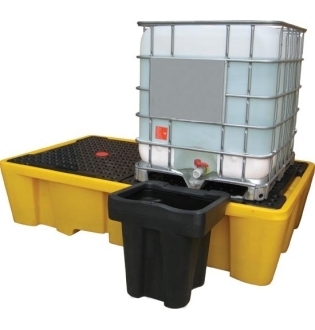 We also have IBC bunds with inbuilt dispensers or ones that you can attached to the bund. These are very practical to use it as a workstation and if you often use the tap. This way it will catch any drips from the tap. We also sell bunds for drums and work flooring and if you need any information about these products, or anything else please contact us.